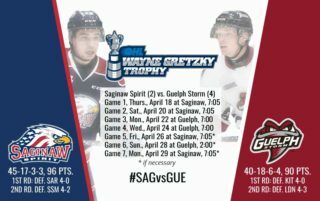 Windsor, ON – The Saginaw Spirit collected their third consecutive victory Thursday evening over the West Division rival Windsor Spitfires, 4-1. The Spirit have won four of the last five games against the Spitfires after dropping the first three games of the season. Arizona Coyotes prospect Ivan Prosvetov had an excellent goaltending performance in the victory. The Spirit goaltender stopped 31 of 32 shots to collect his 26th win of the season. Prosvetov had to be strong early when the Spitfires had the sustained offensive pressure. Nathan Staios’ shot from the point was snagged by a quick glove save by the Russian goaltender. Cole Coskey put the Spirit on the board first with his team leading 29th goal of the season on the power play. 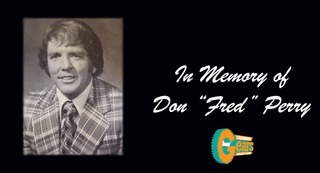 The right-winger took a wrist shot from the left wing half- boards on his off-wing that ricocheted off two Windsor defenders and deflected into the net. The goal was the Zion, Illinois native’s 10th goal with the man-power advantage this season, the most of any Saginaw Spirit player. Rookie Cole Perfetti extended his point-streak to five games with the secondary assist on the play. Saginaw’s fifth overall pick in the 2018 Priority Draft has been one of the most consistent Spirit performers this season. Edmonton Oilers prospect Ryan McLeod had a glorious chance to add to the Spirit lead early in the second period. After a nice drop pass from Coskey, McLeod sent a wrist shot from the left face-off dot that beat the Windsor goaltender but clanked off the crossbar. The Spirit made it a two-goal lead midway through the second period with Detroit Red Wings prospect Brady Gilmour’s 9th goal of the season. Great tic-tac-toe passes from 2017 Florida Panthers 10th overall pick Owen Tippett and Perfetti allowed for an easy tip-in goal for Gilmour. Gilmour, a seventh-round pick of the Red Wings, got rewarded for his hard play after going goalless in the past 13 games. Tippett, who signed an entry-level contract with the Florida Panthers last season, has an assist in the past two games. The two games prior was the first time this season the right-winger was held scoreless in consecutive games. Windsor’s goaltender Kari Piiroinen kept the Spitfires close in the second period of play with several big saves. The biggest in the second period came off a three-on-two rush when Saginaw defenseman Justin Murray took a quick wrist-shot from the top of the slot. The Finnish goaltender extended a right shoulder up to keep the puck out of the net. 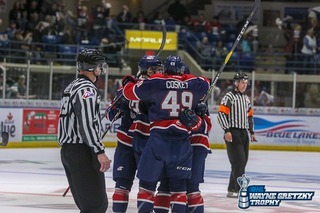 After Coskey was called for a tripping penalty in the opening minute of the third period, Windsor’s Jean-Luc Foudy put the Spitfires on the scoreboard. 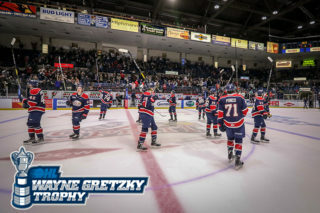 After a clean face-off win in the Spirit zone, the rookie Foudy took a slapshot from the top of the right circle that beat Prosvetov over the shoulder. 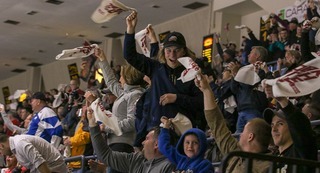 Saginaw got the goal right back on the power play just over three minutes later with Coskey’s second goal of the game. Coskey created some room for himself in the Spitfires zone and sent a wrist shot from the left half wall. The shot squeaked through the goaltender Piiroinen’s pads and slid into the back of the net. The Spirit’s fourth goal came in the waning minutes of the third period with Minnesota Wild prospect Damien Giroux’s 20th goal of the season. A great rush and drop pass from defenseman Reagan O’Grady found an open Giroux in front of the Windsor net. Giroux sent a one-time tip-in short side past the Spitfires net-minder. The Spirit captain secured his second consecutive 20-goal season with the goal. Giroux has shown strong leadership qualities since taking over as captain after Keaton Middleton moved to the AHL’s San Jose Barracuda before the start of the season. New York Islanders prospect Bode Wilde collected his third assist of the game on the Giroux goal. It was the star defenseman’s third three-assist game of the season. The Spirit returns home Saturday, February 9 to take on CHL’s third ranked London Knights for the fifth annual Talk Today Hope for Tomorrow Game presented by McLaren Bay Region to help end stigmas attached to mental health. Puck drop at The Dow is set for 7:05 p.m. for the two teams second meeting of the season. 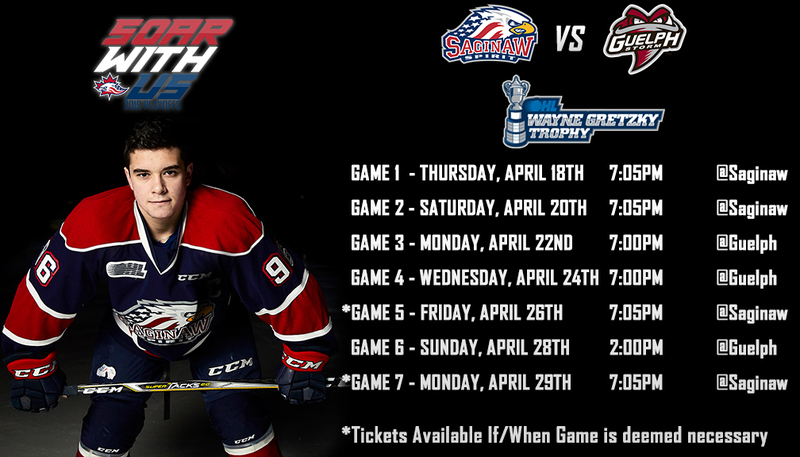 To Purchase tickets to any Saginaw Spirit home game call (989) 497-7747, visit www.saginawspirit.com, or by visiting the Saginaw Spirit Store at 5789 State Street, Saginaw, MI.